“Our economy is strong. Growth is running at a healthy clip, unemployment is low. The number of people working is rising steadily, and wages are up. Inflation is low and stable, all of these are very good signs,” said Federal Reserve Bank Chairman Jerome Powell, on September 26, 2018. Those two comments about the U.S. economy describe the current tug of war that the U.S. stock market has faced. On the one hand, the economy is growing at the fastest pace in a decade. And on the other hand, this strong rate of growth may take interest rates as well as inflation to higher levels. Economic growth may slow. Such quandaries are embedded in the stock market’s psyche and the daily push and pull that evaluates market securities. Stock markets go up, and stock markets go down. For all of us to prosper, we need economic growth. But growth can slow, or even disappear. Markets try to anticipate such changes by focusing on the rates of change and shifting trends, more so than simply using historical facts. So given the stock market’s strong run, investors are wondering how much longer the economy’s strength will support this upward move in the stock market. Markets don’t typically trend in one direction, so it’s only prudent to pause and think about why we invest, and how. Saving money, and managing those savings, is a life-long process. It’s a process we should approach with reflection, understanding and respect for the various risks and surprises the market always doles out. Warren Buffet wrote in his 2011 Berkshire Hathaway annual letter that, “investing is foregoing consumption now in order to have the ability to consume more at a later date.” We save and invest to retain and expand our current purchasing power. And when our economy grows, all of us benefit from the increased opportunities and the additional purchasing power that is created. Buffet argues that only by being invested in productive assets will we give ourselves the chance to grow and expand our existing purchasing power. Robert McDowell, a former Chairman of the Federal Communications Commission, highlights the importance of cellular mobile communications to our future growth; specifically, the importance of 5G, or the fifth generation of cellular mobile communications. McDowell’s perspective speaks to how important it is for America to retain leadership in the development of 5G and technology in general. This race to grow was also recently reflected by Intel Corp’s announcement to invest an extra $1 billion in its production efforts. Industry demand has increased for Intel’s 14 and 10-nanometer processors and Intel doesn’t want to lose business to Advanced Micro Devices or others. Intel also increased their revenue guidance by 7% for 2018; that is, Intel now expects revenue to be $4.5 billion greater this year than it expected in July. Not surprisingly, Intel’s stock rose 3% on that news. Growth is good. Growth helps everybody, and $4.5 billion in additional revenue will create additional jobs and additional revenue for many. That’s what Warren Buffet means when he talks about investing in productive assets. Buffet makes this claim because idle assets lose value as time passes, and because unproductive assets lose value in a world with any inflation. He describes gold as, “being of neither much use nor procreative. If you own one ounce of gold for an eternity, you will still own one ounce at its end.” Fear can clearly create interest in gold and other investment mediums. However, both fear and exuberance can also lead investors to speculate, chase value, and create investment bubbles that often burst. Such is the difficult task of choosing investments. And with a stock market that has appreciated so strongly, investors need to understand that markets can go down, as well as up. But we are not calling investors to sell their stocks and abandon ship. Rather, we believe that investors should look at what they own, and why, examine the mix of their investments, and understand what their cash flow needs might be–both now and in the future. One needs to remember that while the value of one’s net worth will go up and down with the market, one’s cash flow should not. Investors also need to remember that the dramatic fall in the 2008 stock market occurred over an 18-month timeframe, and that market’s fall was by many accounts worse than what happened during the 1930’s. But given the market’s recovery, selling stocks during those 18 months was proved to have been the wrong thing to do. A productive asset’s valuation very rarely goes to zero. Accordingly, investors do themselves a favor if they can avoid selling stocks at the wrong time in a cycle. Instead, investors need to think about how much cash flow their portfolio generates, and whether that might be sufficient for the next 12 or 24 months. And SKY Investment Group can help with these calculations and help determine the mix of stocks and bonds that best support needed cash flow. Preferably, we like to buy stocks when they’re on sale and their values are cheap, rather than chase prices and buy stocks at the upper end of their valuations. 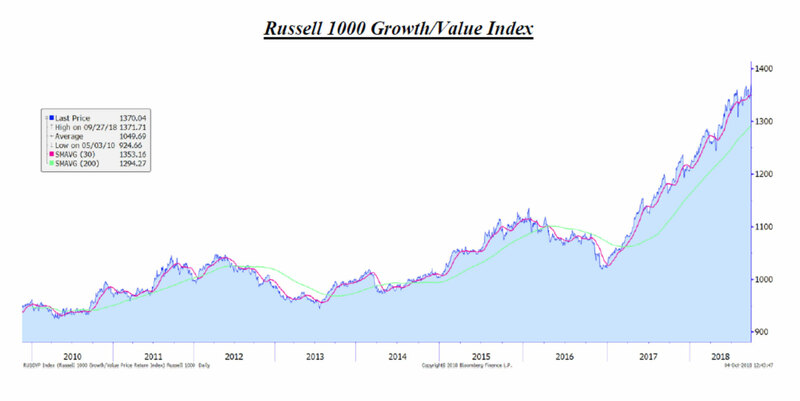 For instance, if we compare the Russell 1000 Growth Index to the Russell 1000 Value Index and compare how those two groups of stocks have fared during this decade, the comparison is quite dramatic. As depicted in the adjoining graph, the Russell 1000 Growth Index outperformed the Russell Value Index by some 30% since December 30, 2016. This preference for growth stocks has persisted for nearly two years, and it may or may not continue. But as mentioned earlier, strong one-way movements for any stock, or group of stocks, should encourage investors to pause and reexamine investment strategies. With this lop-sided comparison of growth to value we think it remains prudent to be defensive in an effort to limit one’s downside risk. Now clearly, such an anomaly can continue for extended periods, and maybe such a change is what we have witnessed. But importantly, if a portfolio is built for one’s needs and objectives, that portfolio should generate sufficient cash flow to pay the bills and weather future market storms. 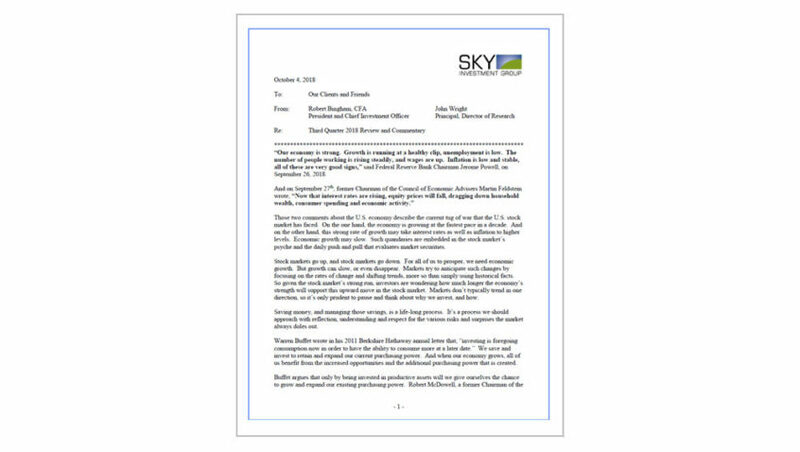 At SKY, we try to build portfolios to meet our clients’ needs, rather than chase stocks simply because they have performed well. Despite these previous comments, we still believe our economy’s growth trends remain firmly in place for both this year and much of 2019. Corporate earnings are expected to be strong again here in the third quarter with the expected growth in S&P 500 earnings to approximate 20%. That’s a lower rate of growth than the 25% rate seen in this year’s 1st half, but it’s still inordinately high and very strong. The 4.2% growth in Gross Domestic Product during 2018’s 2nd quarter was also exceptionally strong. And most economists expect this year’s 3rd quarter growth to be between 3% and 4%. Such growth should expand the opportunities for many in our country and it may also create stronger demand for workers, goods, and services. Schwab’s Chief Investment Strategist, Liz Ann Sonders, believes that the bull market may be “lengthy in time, but not in temperature.” Economists still are not seeing huge excesses in the economy, and inflation still has not accelerated excessively. But as she also said, “Goldilocks has left the building.” While risks abound, no imminent recession lies just ahead. Indeed, Federal Reserve Chairman Jerome Powell appears spot on and that the health of our economy is excellent. Yet, economist Martin Feldstein may also be correct, and that less rosy times lie ahead. Often the stock market anticipates such changes and backs off ahead of time. But more importantly, we want our clients to assess their individual needs, the level of risk with which they are comfortable, and whether their cash flow needs are being met. For even though we should expect the stock market to go up and down, that doesn’t mean one’s cash flow should go up and down too. Our job is to find quality investments that deliver reliable income streams, so investors don’t have to worry so much, even if the value of their net worth does fluctuate. Please call us if you have any questions or would like to visit about the mix of stocks and bonds in your portfolio.